Chelsea have reportedly made contact with Sevilla to discuss a move for Pablo Sarabia at the end of the ongoing campaign. Sarabia has been in prime form for the Andalusian outfit this term and he has already contributed seven goals and seven assists in La Liga alone. According to Estadio Deportivo, the 26-year-old's form has caught the attention of some of Europe's elite clubs and the Blues are firmly in the hunt after making an enquiry with Sevilla. Sarabia, who can play across the attack, is currently contracted to Sevilla until June 2020 and the lack of breakthrough over an extension could tempt them to sell in the summer. 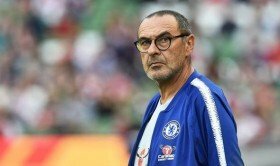 Chelsea are currently loaded with attacking options with Eden Hazard, Pedro and Willian among the regulars on the winger but the future of the former remains in doubt beyond the summer. The Blues have already pursued Christian Pulisic from Borussia Dortmund with Hazard's contract situation in mind but they are keen on further reinforcements ahead of next season. Hazard has yet to commit his future beyond the summer of 2020 and the failure to do so by the summer could witness Chelsea sanction his sale with Real Madrid likely to approach for him.